Having fresh flowers on my dining room table makes my whole day better, but I can't always afford to have an amazing arrangement from my local florist. Instead, I've found ways to make standard grocery store bouquets look like unique floral arrangements made just for me! If you enjoy playing with flowers (who doesn't?!) then you'll love this simple way to make fabulous floral arrangements with the bouquets you find in your local grocery stores. Sometimes when I scan the aisles of Target, things catch my eye that I don't have an actual use for...like placemats. I use placemats for just about anything other than their intended purpose. (I am millennial after all, and we probably killed placemats like we did everything else, ha!) In this case, I turned a placemat into a clutch by adding a zipper and a tassel zipper pull. Even the beginner sewist should be able to conquer this project in less than 30 minutes. If you're cleaning out your closet as part of an organizing resolution, then here's an idea for all those t-shirts you'll be getting rid of! I always say it, but it really is amazing what a coat of paint can do. The color possibilities are endless and a new paint job just breaths life into anything! We've been needing some dining chairs for about a year now, and I found some old yellow ones at a yard sale for $3 each! Needless to say, I scooped those up and gave them some DIY lovin'! All it takes is minimal effort to find Indigo Shibori fabric all over the internet. The design is so unique and is easier than ever to create at home. It's as simple as taking an old pair of jeans and dipping in some bleach! Sometimes I come across an idea online and am so smitten. I then slap the side of my head for not thinking of it first! That's exactly what I did when I stumbled upon this genius light garland idea. How fun for a backyard party, am I right?! Sometimes those really ugly pieces of furniture CAN serve a purpose! This old coffee table got a trendy makeover and is now a gorgeous piece that the owners can display proudly! Bar carts aren't just for beverages anymore. 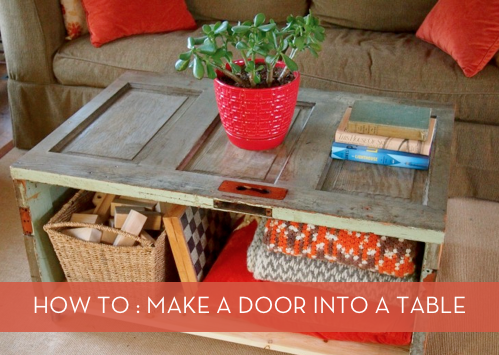 Pick up an inexpensive cart and bring the garden inside! How To: Turn an Old Leather Belt into DIY Drawer Pulls! Well... THIS is cool! Before you think to toss an ill-fitting belt into the trash (or donation bin), check out this awesome DIY idea!